Whenever a licensed electrician completes any electrical installation work, they must provide a Certificate of Electrical Safety (CES). 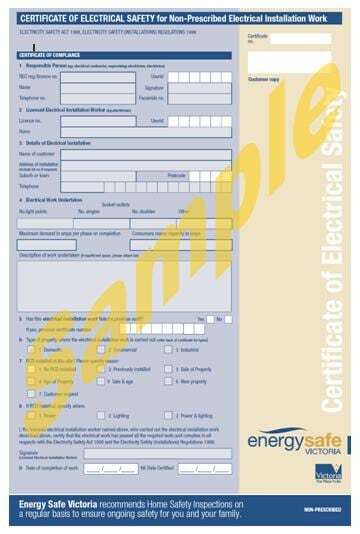 Certificates of electrical safety are only available from qualified electrical workers who are registered or licensed with ESV. As such, a certificate is assurance that the work has been done by an appropriately qualified person and that it has been carried out in accordance with the high standards demanded by the ESV. The work is subject to audit to ensure it complies with the standards. 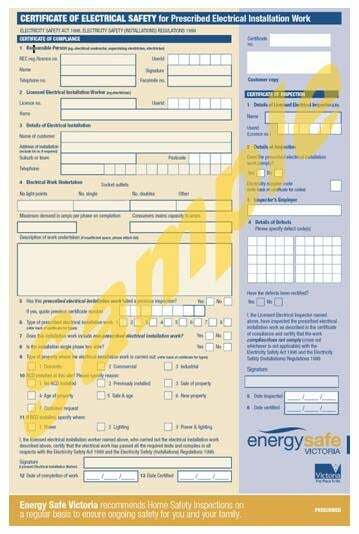 You will receive a prescribed certificate for all major electrical wiring work in all types of premises. In a domestic situation, this covers all work done on wiring and equipment where you cannot switch off the electricity. This generally means work on wires up to the switchboard and may include the wiring from the street to the house/building and the electricity meter. All prescribed work must be inspected by an appropriately qualified inspector (this will be arranged by your electrical contractor). 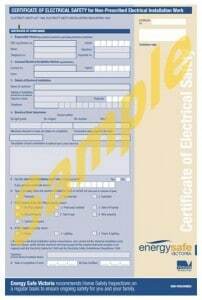 You will receive a non-prescribed certificate for all minor electrical wiring work in all types of premises. In a domestic situation, this covers all work done on wiring where you can switch off the electricity at the switchboard. For example, installation or maintenance of safety switches, circuit breakers, power points, non-plug in electrical equipment or lighting points within the house. 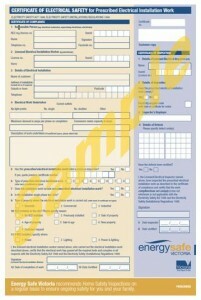 Non-prescribed work does not require an electrical inspection.